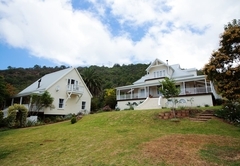 Beside Still Waters is a highly recommended B&B with self catering option, providing accommodation in Wilderness for tourists visiting the Garden Route region. 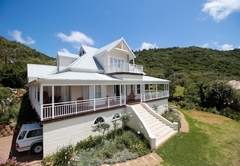 Beside Still Waters' is located in the heart of South Africa's magnificent Garden Route between Wilderness and Sedgefield, and offers bed and breakfast and self catering accommodation for families, couples, individuals or groups. 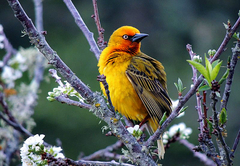 Visitors from all corners of the globe travel to this lake-land treasure, part of the Wilderness National Park, to experience the natural beauty, bird and animal life. 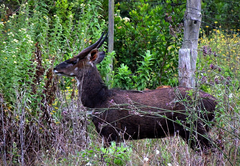 Nearby towns include George (16km) and Knysna (40km). 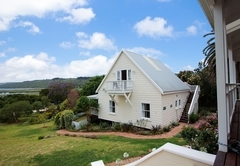 Oudtshoorn, Plettenberg Bay and historic Mossel Bay are each less than 1½ hours away. 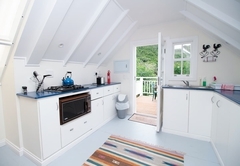 The Cottage is a dream - with two bedrooms (a double and a twin; which can be converted to a 'king'), a bathroom (with under floor heating), equipped with a shower, small bath, basin and toilet. The spacious, light-filled open plan living area with fireplace and fully equipped galley kitchen offers quality and comfort. 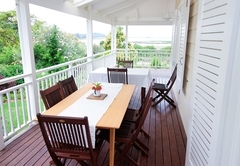 The generous veranda with its stunning lake view is a perfect spot for outdoor dining or simply dreaming. 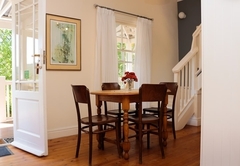 The inside staircase connects The Cottage to The Loft and these two spaces can be used together to accommodate a larger group. The Cottage has a TV and a DVD player. 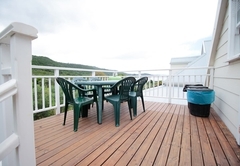 It has a dedicated parking place and private braai facilities. 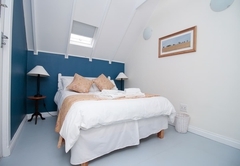 The Loft is a fully contained tastefully decorated bed-sitter for two, furnished with a double bed, bathroom with shower, basin and toilet, well equipped kitchenette and two small balconies - ideal for meals with a view. 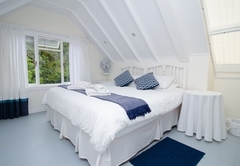 It has an outside entrance with private staircase plus inside stairs connecting it to the Cottage so that it can be used independently or with the Cottage. The Loft has air-conditioning for added comfort in all weathers. Dedicated parking is provided. Braai facilities are available. The Loft has a DVD player but no DStv connection. There is a range of DVD's on loan. 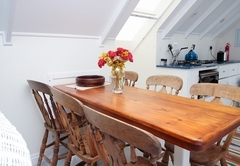 This three bed-roomed unit is a large, character filled attic. 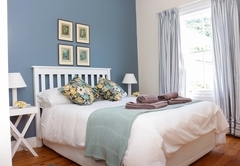 The main ensuite twin bedroom can be converted to a 'king' as required. 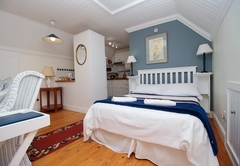 There are two more cosy rooms; one with a double bed and the other with small twin / queen with an inter-leading bathroom. A large airy kitchen and lounge/dining area complete this unique space. A television set and DVD player are provided with a good selection of DVD's, but there is no DStv. 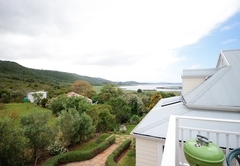 The sundowner balcony has stunning lake and inland views and leads to a private braai area. Secure parking is provided. 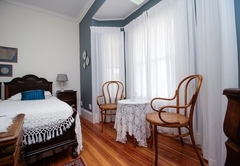 The Vintage Room is a bay-windowed, double room with French doors leading to a wrap-around veranda. East-facing, it provides breathtaking views of the Lake specially at the beginning and end of each day And Full Moon is spectacular! 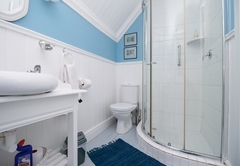 The elegant bathroom has a roll-top 'Victorian' bath and its under floor heating adds a touch of comfort during the chilly season. The peaceful blue and white decor reflects the beauty of the sky and water. The Harlequin Room with its black and white theme is reminiscent of the 1920's. Its chic bathroom with generous, inviting shower is a treat! This bathroom also has the added comfort of under floor heating. The twin beds can easily be converted into a king-size bed when needed. 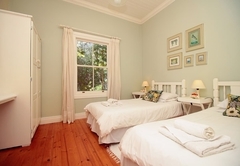 This room also opens onto the veranda and has views of the Fountain Courtyard and the fynbos studded hillside. 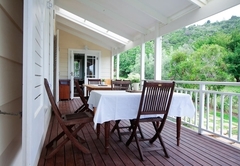 A full breakfast is included and evening meals can be arranged on request. 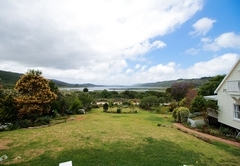 2 bedroom and 1 bathroom, 1 double bed + 2 single beds, Self-catering, fully equipped kitchen, braai facilities, view over the lake from the veranda. 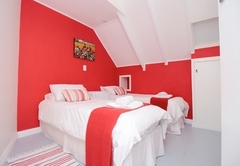 Attic apartment with fully equipped kitchen, bathroom, 1 double bed, veranda with view over the Langvlei Lake. 3 bedroom and 2 bathroom unit, 1 king size bed, 2 single beds, 1 double bed, fully equipped kitchen, veranda with view over the lake and indigenous bush. 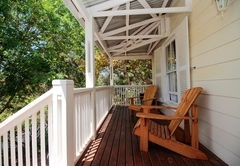 Room in main house with own entrance, two single beds,bathroom with bath, entrance from veranda with comfortable deck chairs to enjoy the leafy garden and rich bird life. 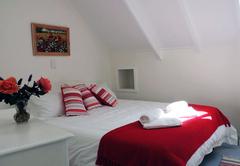 268 Reviews from SA-Venues.com travellers. All reviews are verified. This was a lovely place for a holiday. It was clean and everything needed was available in the cottage. The garden, view and surrounding area is beautiful and it was a peaceful location. The hosts were friendly and helpful. Highly recommended. We will certainly return! Baie netjies, baie mooi. Hoë kwaliteit akkommodasie. Vriendelike gasvrye ontvangs. Beside Still Waters kan baie sterk aanbeveel word. Dankie! Dit was 'n voorreg om daar te kon oornag. Response timeBeside Still Waters typically responds to requests in 5-10 minutes.